Spain’s Supreme Court will call former Spanish Prime Minster Mariano Rajoy to give evidence in the upcoming trial of Catalan pro-independence leaders, now confirmed to start on 12 February in Madrid. He will be one of ‘hundreds’ of witnesses to testify at the trial, a Supreme Court document said. Rajoy sacked the Catalan government and called snap regional elections after the Catalan parliament declared independence in October 2017, following a banned independence referendum. He was unseated by a no-confidence vote backed by Catalan pro-independence parties last year. 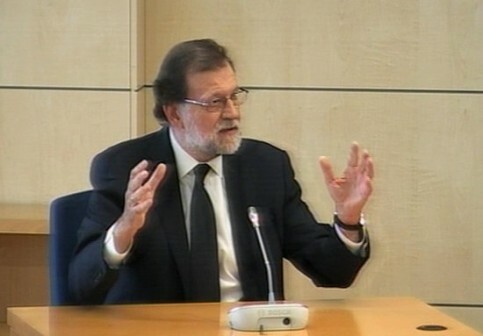 The former Spanish prime minister’s appearance at the trial will be the second time Rajoy has been called as a witness in a major trial, after he gave evidence on 26 July 2017, when he was still in office, for the Gürtel corruption case. Rajoy’s deputy prime minister Soraya Saez de Santamaria, former Catalan president Artur Mas and Barcelona’s current mayor Ada Colau are also among those summoned to testify in the trial. The court said it would also hear testimony from police officers and citizens who were injured during clashes suring the 1 October 2017 independence referendum. Riot police beat protesters and stormed polling stations on the day of the referendum in an attempt to stop it from going ahead. But the court refused a request to summon as expert witnesses US linguist and social critic Noam Chomsky and respected British historian Paul Preston. It also declined to call on Spain’s King Felipe VI to testify. Nor will the court call on former Catalan president Carles Puigdemont or former Esquerra (ERC) party head in Catalonia, Marta Rovira, both of whom are in exile. The court has rejected calling Puigdemont and Rovira as witnesses, as demanded by some of the defence teams, as they are among the leaders being prosecuted, which the judges consider to be incompatible with them giving evidence. The judges also rule out calling on People’s Party (PP) spokesman Ignacio Cosidó, as demanded by the defence teams of some of the jailed leaders. Cosidó was at the centre of a controversy over leaked messages casting doubt on the neutrality of the Spanish judiciary, but the court considers his case to have little to do with the upcoming trial.